JANE SEYMOUR TO APPEAR AT "SOMEWHERE IN TIME" 35TH ANNIVERSARY SCREENING, DECEMBER 15, L.A.
Jeannot Szwarc’s 1980 film Somewhere in Time, which stars Christopher Reeve, Jane Seymour, and Christopher Plummer, will be screened at the The Royale Laemmle Theater in Los Angeles. Based upon the novel by Richard Matheson (who also wrote the screenplay), the 103-minute film will be screened on Tuesday, December 15h, 2015 at 7:30 pm. Network are releasing The Amorous Prawn (1962) on DVD on February 8, 2016. This is one of John Barry's earliest film scores and a rare outing into the field of comedy, at a time when he was also working on some jazz music for The L-Shaped Room and creating The James Bond Theme! For those in Australia, The Dove is being shown on 9GEM (ch90) at 3:00 am tomorrow (Saturday) morning 28/11/15. Update November 28: My contact reports it was screened in 4:3 and didn't look right. We have added a new feature to our website: UK TV listings of films scored by John Barry or John Barry related programmes.Second item in the black Menu bar. So, again, these are UK listings only, but do let us know of any others worldwide. We are delighted to say that acclaimed former Shadows drummer and composer Brian Bennett has just released a new CD entitled Brian Bennett -- Shadowing John Barry. It consists of Warren Bennet arrangements of fourteen JB compositions featuring a variety of guitarists, including Ray Russell, Mark Knopfler, Brian Locking and Peter Frampton. "Join the TSO as we celebrate over 50 years of the suave super-spy's globe-trotting adventures with two nights dedicated to the many memorable songs and scores that Bond inspired. With a program that includes Goldfinger, You Only Live Twice, On Her Majesty's Secret Service, Live and Let Die, Nobody Does It Better, Skyfall, and even Sam Smith's newest Bond chart-topper, Writing's on the Wall, music and movie fans will find themselves both shaken and stirred." "The La Crosse Symphony Orchestra is staging a special concert Saturday featuring the London production of the original and ultimate James Bond show with soprano Mary Carewe..."
John Barry – one of the most distinguished composers of film music in the world – receives worthy acknowledgement in the form of Soundtracks & Singles 1963 – 1966, a 3CD retrospective which highlights a particularly fertile period. An appropriate accompaniment, November also sees the release of a long out of print 180 gram vinyl edition of the original Zulu soundtrack. One of Barry's most iconic works, the 1964 Zulu soundtrack is a momentous early achievement that sits comfortably with his famed contributions to the James Bond series. Mastered from original stereo tapes and featuring bit part narration by Richard Burton, the original music of the BAFTA-nominated film is here fleshed out with Southern African-influenced beat instrumentals performed by the John Barry Seven. As well as a vinyl edition housed in original artwork and label design, Zulu also forms the first disc of Soundtracks & Singles. Succeeding Zulu a year after and compiled on the second disc of the Soundtracks & Singles 1963 – 1966 collection is the original soundtrack to 1965's Four In The Morning, a critically acclaimed film which won plaudits for a young Judi Dench. Presented in mono format, as well as stereo, its soundtrack is a more subdued, haunting entry in Barry’s oeuvre. On this edition, the atmosphere of the film is further ingrained through dialogue excerpts featuring Dench, Ann Lynn, Norman Rodway, Brian Phelan and Joe Melia. Both Zulu and Four In The Morning were originally released on British independent label Ember, where John Barry was associate producer and head of A&R in the early sixties. Compiled on the final part of the set are Barry's other Ember recordings, productions which include an alternative organ-accompanied version of the From Russia With Love theme – a major UK hit single in its time – and a curio centred around the Profumo scandal, mysteriously credited to a certain 'Miss X'. The 60s masterworks of a true British maestro lovingly restored. The box-set also includes an 8-page booklet with full track-details and a rather nice, if familiar, period photo of John Barry. 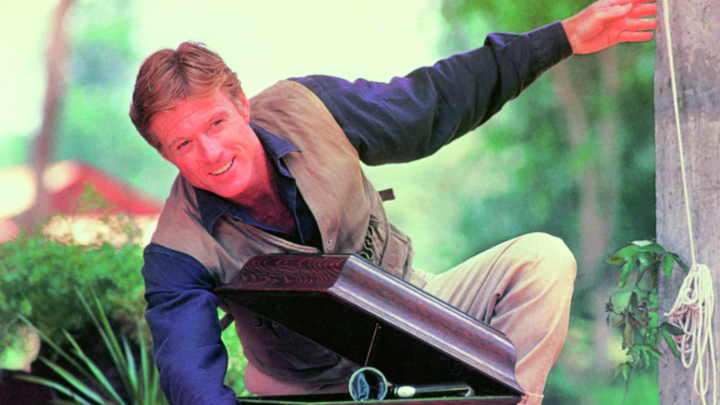 Meryl Streep and Robert Redford star in this sweeping romance between a plantation owner and a big-game hunter. John Barry’s luminous score is one of the chief virtues of Pollack’s misty-eyed tale of a doomed romance on the African plains. It accompanies Karen and Denys’ plane ride over the sweeping landscape and creatures of the country they loved. Neil Brand introduces the screening with points to listen out for on this musical journey. Joint ticket available with The Music of Love on Screen £16, concs £12 (Members pay £1.70 less). Please note the joint ticket price is only available in person or by phone on 020 7928 3232. Twilight Time are releasing Born Free on Blu-Ray on December 8th. Although they are based in LA, I assume this will be Region-free -- 99% of their releases are. We have added a new series of photos to our Royal Albert Hall Memorial concert 2011 page. The photos were taken by Juan Delhom. Scroll to bottom of page. Let Royal Northern Sinfonia sweep you off your feet with some of John Barry’s most evocative and picturesque scores, from the menace and power of Zulu to the expanse and romance of Dances with Wolves. Music from all the great Bond films, in time for the release of new film Spectre. "After five long years, the Royal Philharmonic Orchestra is proud to bring its much-loved The Music of Bond show back to the Royal Albert Hall." London. The RCM Student’s Film Orchestra pays tribute to influential and admired composer, John Barry. They will play hits from the film industry, including songs from the James Bond franchise. Comment from Geoff Leonard: "Good news! It's a John Barry 'only' concert!" A surprise but very welcome announcement from Intrada Records sees the première CD release of The Dove. Not only that, it is an expanded edition with eleven bonus tracks, most of them being mono score cues never previously released. According to Intrada, the original album tracks have been "newly re-mixed and re-mastered in vibrant stereo from 8-channel session masters stored in pristine condition in UMG vaults." Available either direct from Intrada or from SAE, this is clearly an essential purchase for all John Barry fans! To celebrate the 50th anniversary of Sidney Furie's acclaimed film of Len Deighton's The Ipcress File, writer Edward Milward-Oliver has combined with designer Brillo to create a most impressive moviegraphic. John Barry's music score was a key component in the success of the film and its lasting appeal, and is given full credit, as are the principal musicians. It's difficult to know where to start when it comes to a review of Graham Rye's new book, Goldfinger Portfolio, because it is such an incredible achievement. Bearing in mind this is primarily a John Barry website, I will clarify from the outset that the book devotes several pages to the music in the film, with the only slight downside being that myself and Pete Walker are the writers! Hopefully we have managed to convey some of the background and the ultimate smashing success of the Bassey single and John Barry album. Also included is an excellent article by Norman Wanstall, who won an Oscar for Best Sound Effects, and gives a detailed account of attending the ceremony. In addition, there's the opportunity to see production designer Ken Adam's fascinating original sketches. However, the real stars of the book are the photographs. It's hard to imagine that anything from the film has been omitted, as page after page reveals more and more surprises, with, in many cases, accompanying stories. As well as main stars, Sean Connery, Honor Blackman, Harold Sakata & Gert Frobe, there are photos and stories from actors who had less to do in the film, such as Margaret Nolan (Dink), Tania Mallet (Tilly Masterson), Nadja Regin (Bonita), Nikki Van der Zyl (heard, but not seen), and, of course, Shirley Eaton as Jill Masterson. Although inevitably many of the photos were taken at Pinewood Studios, we also go on location to Switzerland and the golf club at Stoke Poges for some terrific shots. There are film posters and pages from press books -- often reproduced to the full extent of the book's large pages -- as, indeed, are many of the photos of the cast, in both colour and black and white. Some of my favourite photographs are those taken when the cast are relaxing in between takes. The book itself is extremely heavy-duty being a wiro-bound steelbook, and the shiny gold covers are a work of art in themselves! It's an expensive book at £350 -- there's always a downside -- but it's limited to 350 copies and could well become a most sought-after and valuable collector's item for Bond fans in the future. You probably need to be a dedicated Bond fan to purchase this book, but if you are and do, I don't think you'll regret it!! Monday 9th February is a red-letter day for fans of John Barry! This is the official release date of three Network DVD/blu-ray editions of films he scored, and, as part of the special features, each contains music suites comprising of the greater part of each score. A very faithful re-recording of Raise the Titanic was released on CD some years ago, but this will be the first opportunity to hear Barry's score without the distraction of dialogue, and, for the most part, sound effects. The suite contains more than 40 minutes of music. The Tamarind Seed has been the subject of bootleg CDs over the years, and appeals for an official release have been ignored to date. Fans will therefore be delighted to learn there are two music suites on the DVD/blu-ray! The first contains virtually every note of Barry's score, while the second contains not only two takes of Wilma Reading's Pye single, Play It Again, but also two versions of Barry & Don Black's first attempt at a song, namely The End, performed by Danny Street. This will be the first time it has been heard by all but a handful of the original film makers! Lastly, we have The Legend of the Lone Ranger. Recorded by Barry in Paris in 1980, during his exile from the UK, the original LP consisted of only 26 minutes of music. The suite included here is more than twice this length and includes all the music in the film composed or arranged by John Barry. Moreover, there is a second suite consisting of the various vocals and narrations by Merle Haggard which are heard throughout the film. Each release will also contain a booklet comprised of photographs from the film and notes on the film and music by Pete Walker & Geoff Leonard. Kickstarter campaign to re-record Moonraker cancelled! James Fitzpatrick says in a message to all who pledged for this project: "It is with great regret that I have to cancel this Kickstarter project before any funds are taken. Certain rights issues have been raised which might mean protracted negotiations with the companies involved which may well go beyond the end of the project. I would sincerely like to thank everyone for their involvement in the project and if negotiations are successful then I have the knowledge that there is a great demand for this title. Thank you for all your hard work." Producer James Fitzpatrick, veteran of many excellent recordings of John Barry film scores, alongside orchestrator/conductor Nic Raine, has initiated a Kickstarter campaign in order to raise £25,000 to cover the cost of a new recording of Moonraker. I'm getting in touch because, as you may be aware, voting in the Hall of Fame 2015 is now open. At the moment John Barry's highest entry in the chart is the Dances with Wolves at No. 107 and it would be lovely to see some of his work climb higher in the top 300 this year. I wondered if you might want to let your members and followers know that voting is now open – and if they vote they'll be entered into a prize draw in which they could win £1,000. Voting closes on 28 February and the results are announced on Classic FM over the Easter weekend.